Now many weeks into my Beyond the Classroom experience, I have realized that I will not be able to fit all of the things I have learned into this short blog post. I will not be able to tell of the many people I have met with and their views on issues like logging, farming, ranching, forest fires, or water rights; nor will I be able to perfectly explain the way that the Swan Range looks in the morning, the sun creeping slowly up and over the crest while a light powder from the night before glistens against the pink morning sky. I will not be able to show you the changing colors of the larches or the size of the grizzly bear track I found this morning, but I can tell you that it is these moments in particular that have made this semester one of the most enriching, educational and valuable experiences of my life. 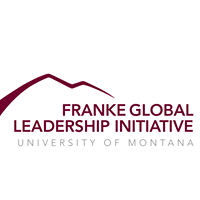 As a third year environmental studies student at the University of Montana, the global challenge that I chose within GLI is to examine the teachings of environmental education through hands on learning techniques, particularly among youth. This semester, I am a student of exactly that. Living in the Swan Valley of Montana with nine other students in an old homestead barn, we are learning to interpret the natural world around us every day in the field. From snorkeling and identifying native fish in the Swan River, to identifying flora and fauna around the valley, we have been interpreting and experiencing first hand what it means to live in rural Montana. Living in a town of nearly 600 year-round residents, I have witnessed the connectedness of a community formed of sheer numbers. I have understood their rural lifestyles and the needs for hunting and fishing when the closest grocery store is 45 miles away. I have recognized the pride and love that each community member holds for the Swan Valley and their appreciation to be able to live in one of the most beautiful places on earth. Coming from the “big city” of Missoula, it has been interesting to switch places and accept the view that locals have on the environmentalist city slickers that live there, much like myself. And through this vision, I have learned that there is no right or wrong in any of this. I have agreed with environmentalists and loggers alike, have spent a weekend bear hunting and shooting pistols alongside the yellowing snowberry, while continually being astonished at the Mission Mountains caked in snow. One of the most applicable things I have learned this semester is the idea that “values trump facts.” As I continue down this tract of environmental conservation, desperately searching for some middle ground that people can agree on, I will keep this forever in my mind as a tool to apply to any single person, whole community, or even on a national scale. You cannot try to change people’s beliefs, but you can listen, interpret, and be aware of yourself as well as others in the place that you inhabit. So as I sit on the back porch of the cabin we call the cookhouse, looking out over the grazed pasture full of horses and deer alike while the Swan Range towers over like the dramatic backdrop to a movie, I know that I am lucky to have these experiences. I know that although I may not be able to explain all of the different viewpoints I have heard and things I have seen through the writing of this small piece, I have learned and will be able to apply these skills and knowledge to other natural resource and sustainability issues around the world.